An export achievement award for Runcorn-based security printer. 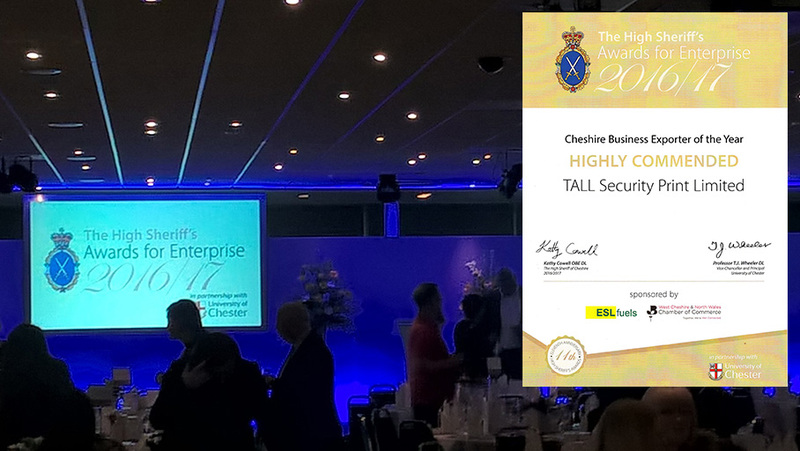 TALL Security Print is delighted to have been given a ‘Highly Commended’ certificate at the recent High Sheriff of Cheshire’s Awards for Business Enterprise. The company received the export achievement award as one of two nominations for the prestigious Cheshire Business Exporter of the Year category at the event. The judges wanted it to be noted that “TALL Security Print had achieved high standards with its entry and the work done at the Runcorn site to develop its export markets”. The awards dinner held at the Chester Racecourse attracted business leaders and staff to celebrate the work performed throughout Cheshire, sponsored by the High Sheriff of Cheshire, Kathy Cowell OBE DL. As a finalist, a short promotional video was filmed at Runcorn for TALL Security Print prior to the awards dinner. Peter Andrew, TALL Group Sales & Marketing Director, was interviewed for the video and showed the film crew round the site. Click on the image below to see the video on YouTube. The TALL Group of Companies has gained the recently launched Government-led Cyber Essentials certification. 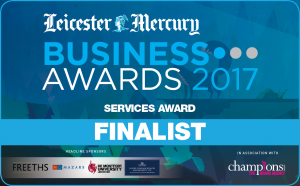 The Cyber Essentials scheme is part of the UK Government’s National Cyber Security Strategy and provides an independent assessment of the essential security controls that businesses need to have in place to mitigate risks from web-based threats and cyber-crime. One in four businesses reported a cyber-breach or attack in the past 12 months (Cyber Security Breaches Survey 2016, Department for Culture, Media & Sports). By successfully going through a Cyber Essentials assessment, businesses not only lower their risk of serious data and financial loss, including intellectual property theft but also, by displaying the Cyber Essentials’ badge on marketing collaterals, they demonstrate to customers and suppliers that they have taken steps to be fundamentally cyber safe. According to its documentation, ISO 27001 was developed to “provide a model for establishing, implementing, operating, monitoring, reviewing, maintaining and improving an information security management system.” As such, ISO 27001 provides a top-down, risk-based approach and is technology-neutral whereas the Cyber Essentials certification focusses attention on key areas of IT systems security and provides real assurance that the TALL Group has appropriate measures in place to secure sensitive data. The introduction of the new Image Clearing System will improve the efficiency and speed of the cheque clearing process by using the latest 21st century imaging technology, either through a mobile phone or dedicated cheque scanner, whilst at the same time protect the continuing use of the paper cheque for those who feel more comfortable using this traditional payment method. 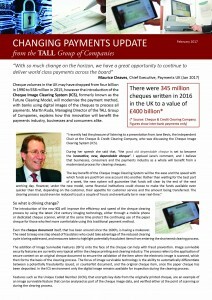 View our latest Changing Payments Update newsletter by following the link below. Click on the image of the newsletter. If you would like to sign up for future issues of our Changing Payments Update newsletter, please visit our Contact Us Page, complete the form and select ‘Interested in:’ Changing Payments Updates in the drop down box.